Afghan men stand in front of a collapsed building of a military base after a car bomb attack in Maidan Wardak, Afghanistan, Jan. 21, 2019. 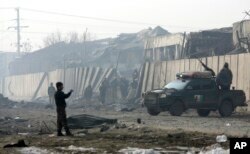 Taliban insurgents launched a major suicide bomb-and-gun attack against a military base in central Afghanistan Monday, and numerous officials reported that at least 126 security personnel were killed. Authorities said the assault took place early Monday morning in Maidan Shahr, the provincial headquarters of Wardak province, about 50 kilometers from Kabul. The key security installation was said to be manned by Afghan special forces assigned to the country's spy agency, the National Directorate of Security (NDS). The Taliban raid began with a suicide bomber detonating an explosives-packed U.S.-made Humvee military vehicle before several of his partners tried to storm the base, the provincial police chief told VOA. Wais Samimi said Afghan forces swiftly engaged and killed the assailants, he added, but declined to give further details. Provincial health officials confirmed to VOA that ambulances transported scores of victims, including the dead, to local hospitals. The Taliban took responsibility for staging the deadly raid. On Sunday, a suicide car bomber rammed a high-profile government convoy in eastern Logar province, killing at least 10 Afghan security forces. The provincial governor and top security officials traveling in the convoy were apparently the target of the attack. The Taliban claimed responsibility. Afghan security forces man at the site a day after an attack in Kabul, Jan. 15, 2019. The Taliban continues to stage spectacular battlefield attacks in Afghanistan despite harsh winter weather. The increased violence comes as the United States has intensified efforts to find a politically negotiated settlement to the 17-year-old war between the Afghan government and the Taliban. Neighboring Pakistan, which is facilitating U.S.-led efforts to end the Afghan war, condemned Monday's deadly Taliban raid. "Our hearts go out for the bereaved families. We share their grief. Such reprehensible acts vitiate (spoil) the environment for ongoing efforts for peace," a Foreign Ministry statement said in Islamabad.